Mainland Bridge and Kara bridge, saying that the action called to question the ability of those in charge to handle matters professionally. A cross section of the motorists, who spoke to our correspondent about the development, said the negligent manner with which some of the construction works in Lagos were being handled leaves much to be desired of a government that is ready to carry out its responsibilities without subjecting the people to needless and avoidable inconveniences. 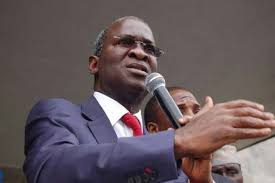 They urged the Minister in charge of the ministries, Mr. Babatunde Fashola and the Federal Roads Maintenance Agency (FERMA) to wake up from ‘their slumber’ and do the needful by going about their duties with utmost regard for the people. A motorist, Mr Samuel Arogundade said ever since the repair work started on Third Mainland Bridge some few weeks back, he has been subjected to untold hardship courtesy of the manner the construction is being handled. He said: “I think Mr Fashola and his men should wake up from their slumber and scant regard for safety to handle their duties professionally. Look at the other day, a serious accident occurred on the bridge involving about ten vehicles. The accident left many injured and it was because the construction was not handled professionally. “The construction company left their equipment on the bridge without any iota of consideration for safety and their negligible action caused the accident. “Apart from the accident, many of us who ply the route daily have been subjected to needless traffic gridlock which is not proper in a city that time is very important to all of us being a city with a lot of business activities,” Joseph said. Another motorist, Mrs Abidemi Olakunle said it was time for the Federal Government to do things properly. “Look for instance, Lagos State Government has constructed four lay-bys in Oworonshoki axis to ease vehicular movement in an out of Third Mainland Bridge. The lay-bys and segregated bus stops have greatly helped to reduce travel time inward and outward Lagos Island but since the Federal Government started repair work on the bridge, they have frustrated all the successes recorded via the efforts of the State Government. “Another thing is that the repair work they are carrying out on the bridge has not even yielded positive impact because up till now, they have removed the asphalt of some sections of the bridge and they are yet to put other ones there. They should just sit up and finish their work on time,” she said.